I have been baiting friends and family to do a bike tour this summer. Two years ago, wifey and I did Austria Last year #3 son joined me on the Erie Canal. Now however, I can't get anyone to commit or even ask the dates, which could be construded as a possibility. I came across a group ride sponsored by The Rails to Trails Conservancy, and decided to take the plunge. The Greenway Sojurn, is a four day tour beginning in Williamsport, PA, riding an average of fifty miles a day, ending in Wellsboro, PA. The route of the Greenway Sojourn will focus on the 64-mile Pine Creek Rail Trail, which parallels the creek through the heart of the Pine Creek Gorge. The rail-trail follows the path of a 19th century railroad that hauled lumber out from the valley. A 2001 article in USA Today named the Pine Creek Rail Trail one of "10 great places to take a bike tour" in the world. Now in 2009, Rails-to-Trails Conservancy offers you and your family the opportunity to join us on a four-day adventure through this amazing natural area. 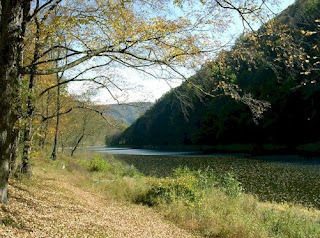 Pine Creek itself is 82 miles of spring-fed, trout-laden water, the largest tributary of the West Branch of the Susquehanna River. The creek path meanders through a beautiful valley with mountains rising more than 1,000 feet on either side. 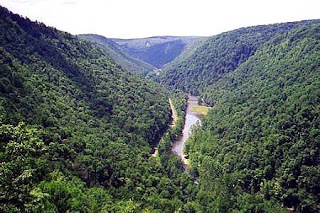 Because of this extreme geographic setting, the valley is nicknamed "the Grand Canyon of Pennsylvania," a part of which is designated a National Natural Landmark and PA Scenic River. The waters of Pine Creek have been rated at High or Exceptional Value by the Department of Environmental Protection. The tour is limited to 250 riders and I'm hoping my application was received in time to get me registered. I really would like to do the Route Verte this year but I'm waiting to see if I'll still have a job. Damn, now I know why you asked about Williamsport. Looks like it'll be a great ride. It's full now, alas. I will probably go ride there some time anyway is it's only a few hours' drive away. Looking forward to your tour reports!